Ultimately, you’re not a leader if no one is following. In other words, exceptional. Leadership requires a climate of trust where people give you their wholehearted commitment. There is an old school of thought that says the course of human history is charted by “great men:” Heads of church and state, generals and business magnates whose individual qualities of vision, courage, and charisma are so powerful that they shape the fate of nations and economies. 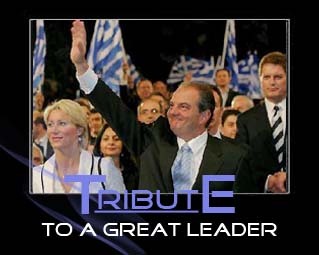 Costas Karamanlis, former Greek prime minister (2004-2009) was one such leader. His family is one of the two most powerful political dynasties in the country and his uncle, Constantine Karamanlis, is a towering figure of Modern Greek history. Constantine was prime minister from 1955 to 1963 and 1974 to 1980. Between the late 60s and early 1970s, he went into self-imposed exile in Paris after a military junta took power in Greece. He returned amid high drama to restore Greek democracy and established the New Democracy Party as a moderate umbrella organisation of right-of-centre groups. While his uncle, a schoolmaster’s son, was known to have an austere personality, Costas Karamanlis was depicted as a more easy-going, charismatic, affable figure, with a love of soccer.Educated in the US and Athens, Costas Karamanlis rose through the party ranks from his student days in the 1980s and emerged as the last-minute surprise winner during a leadership challenge following the conservative right-wing New Democracy party’s 1996 election defeat and became Greece’s youngest political leader in history. When he first rose to power some analysts criticized the move, but in the years as party leader, Costas Karamanlis secured a grip on his notoriously undisciplined party and provided the Greek Prime Minister Costas Simitis’ socialist party (that was in power at the time) with some of the toughest opposition they faced since the 1980s. Voters were immediately captivated by his clear sense of purpose, for he brought hope a renewed commitment, work ethics and impeccable VALUES back into to the political scene. Why would so many turn their backs on such a great visionary you ask? Simple he was too great of a leader for a country so deeply rooted in corruption, that the very thought of an honest man was too good to be true… that is why. In my belief, Karamanlis is a man that leads by example and that is what his opponents eventually used against him to weaken his popularity with the people. Honesty and integrity were and still are the vital ingredients that signal him out from all leaders before him, with an exception of course to his late uncle. He also has courage, let us not forget the veto his government imposed on FYROM’s (Skopje) accession to NATO, and by far he is a true patriot for thinking about his country and his people rather than others’ interests. He was also a leader who planned ahead and worked towards this goal. He wanted to place Greece on the energy map, by allowing several pipelines to run through its boarders. These pipelines, as we all know, did not fit the purposes and/or interests of some western countries and I think that by upsetting the scene he thereby unwillingly created enemies for himself. At the time he also sided with Russia on many other issues which surely upset the West, and he did not support the Kofi Annan’s resolution for the Cyprus issue, which later proved disastrous for the divided island. In simple words, he was and is a true patriot… a man who never thought of his leadership chair and rather worked for the people. It seems that such personalities are not well liked in the political fora. Take John F. Kennedy for example. He went against the system and became a victim by it. Karamanlis is one such other case. Successful or not, liked, or not liked, he is still one of the most effective and profound leaders this country has ever known. For he was committed to worthwhile results and governed himself and the people of this country with those results in mind. It was this orientation that pushed him to be creative in solving problems, to subordinate their lesser motives and to persist in the face of obstacles and it was this commitment that eventually led to his downfall. His opponents still fear him, and still criticise his decisions while during government, even though evidence has surfaced that prove all of this to be untrue. So why so much criticism? Simple: When he speaks he has greater public approval than that of almost all his predecessors and successors and that I guess generates fear in his opponents who thirst for political power. That is why. Until this day he has an almost worshipful attitude by many Greeks and this magic has largely to do with public desire for a heroic, inspiring leaders such as himself. I admired him most for his sense of humour and his ability to speak directly to an audience. Karamanlis’ charisma and charm motivated many Greek people, such as me, who never had a sense of Greek politics, to be the best they could be for their country, and I personally thank him for this. He has kept silent since his resignation as party leader, and I guess in some way it has given ammunition to his opponents to hit him even harder. Those who never stopped believing in him know by instinct that this silence is his weapon to expose all his opponents, and in some way -the system-, that so unfairly hit at him for the past decade. I also believe that in his last speech, just before the 2009 general elections, he indirectly warned us of the things to come… as well as left it to be understood that when push comes to shove that he will stand by our side once again. I long for the day when he breaks his silence and we finally find out why… who…. which… where… when… but “I’m just a dreamer” as Lennon would say…. for I know that truths of those sorts can actually create chaos. And I know, in my gut, that this great man does not like chaos, for he worked so hard at creating a peaceful environment for all of us. I also wish history would repeat itself and that he return to power… just like his uncle did in the 70s. Greece needs and thirsts for leaders such as himself… and even more so in this harsh period we are living, because we need a man with a vision that unifies Greeks, that loves this country and that has the ability to give us some hope again. Until then… he will sadly be missed. ΚΑΤΑΠΛΗΚΤΙΚΟ ΑΡΘΡΟ! ΚΑΛΗ ΕΠΙΤΥΧΙΑ ΣΤΟ ΜΠΛΟΓΚ ΣΑΣ!